Behrendt: “We have become better listeners." Hau Thai-Tang, who replaced Tony Brown as Ford Motor Co.'s purchasing boss this month, oversees a supplier network that shrank by almost two-thirds in recent years. The majority of Thai-Tang's budget -- 65 percent -- now goes to an elite lineup of just 104 preferred suppliers that Ford calls its Aligned Business Framework. Ford officials said the program has helped the company obtain higher quality parts and introduce advanced technologies sooner. 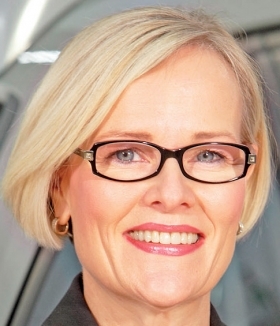 "We want to become the customer of choice," Birgit Behrendt, Ford's vice president of global programs and purchasing operations, told Automotive News. "If you're the preferred customer, the supplier will go to great lengths to work with you and to support you." Behrendt said the Aligned Business Framework has produced useful features such as Ford's hands-free liftgate, which is opened by kicking the air under the rear bumper. The system's supplier, Brose, was among the first companies inducted into the preferred supplier program in 2005. She said the program also has accelerated the spread of technology, such as active park assist and driver-alert systems, from luxury vehicles to mass-market nameplates such as the Focus. Previously, Behrendt said, suppliers working on innovative projects pitched them to other automakers instead because they viewed Ford as slow to implement new technology. More recent studies by Planning Perspectives and other third-party analysts show that Ford's reputation has improved markedly in that regard, which Behrendt attributes to the Aligned Business Framework. "Now, they're bringing their technology to us first," she said. "We weren't known for being great listeners. We have become better listeners. We're not only listening but we're reacting and responding to the input we're receiving." Ford has gone from having about 3,300 direct suppliers in 2005 to 1,260 now. It has identified about 750 that it plans to work with long term. Behrendt said Ford adds suppliers to the preferred list periodically but does not have a specific goal for how many of the 750 ultimately will be part of the program. Among the newest members is Husco Automotive, a Wisconsin valve maker that has been a direct supplier to Ford for about five years. Its president, Todd Zakreski, said Ford's commitment to the company is helping its parent, Husco International, expand in the United States and China with a $45 million investment and 150 new jobs. "They're a big part of that," Zakreski said. Husco International is a $300 million privately held company; automotive accounts for about half of its business, and Ford, its largest auto customer, represents a third of that division's sales. Zakreski said he believes Husco was chosen for its extremely low rate of defects, competitive prices and good relationship with Ford's engineering organization. As part of the Aligned Business Framework, Zakreski said the company gets better access to Ford's senior executives and learns about the automaker's new products sooner. It also can be more confident about future business with Ford, provided that it keeps quality and production up to standards. "It's great for morale," he said. "The employees see it and recognize the importance of being part of the program, and it drives results."